1 Drawing known as “The Dead Bad-Doers,” recto. In the collection of David Bindman. 2 “The Dead Bad-Doers,” verso. A previously unpublished drawing by Blake appeared in a sale at Sotheby’s in London earlier this year and was bought by the present writer. The drawing was described as “The Dead Bad-Doers” and had been sold with the William Bell Scott collection under the same title in 1892.1↤ 1 W. B. Scott sale (14 July 1892), Sotheby’s, lot 135, bt. Ellis (£1.13.0). It had more recently been in the collections of Lord Nathan, inserted in an extra-illustrated volume, and of Mr. F. L. Wilder. 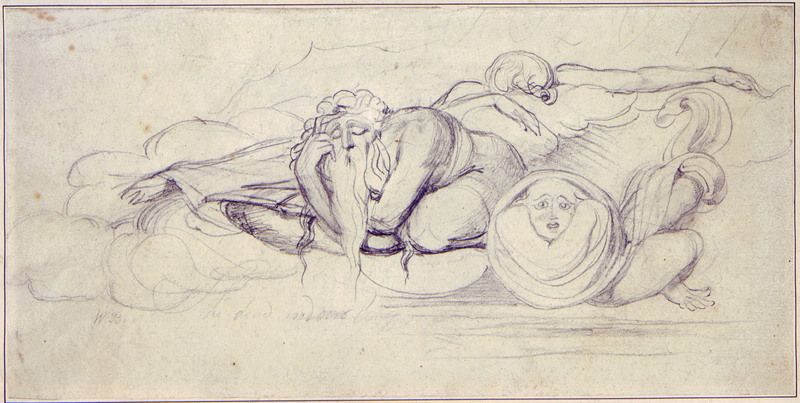 The recto  shows a group of three figures floating on a cloud in various stages of wakefulness, and there is a rather faint inscription of probably four words in what is certainly Blake’s own formal script underneath the bearded figure. This was read by Bell Scott or the compiler of his sale catalogue as “The Dead Bad-Doers,” but in fact only the first two words “The Dead” can be read clearly, and the words following could not be “Bad-Doers.” They are now indecipherable despite prolonged attempts at reading them with ultra-violet light. A pencilled inscription “W. B.” to the left of the inscription does not seem to be in Blake’s hand. The verso  contains a faint sketch which Mr. Martin Butlin has identified as a study in reverse for the titlepage of The Song of Los, of Urizen reclining with his hand on a skull. The drawing on the recto does not correspond to any known composition by Blake, but it does have a general similarity in atmosphere and style to some of the plates in The Book of Urizen, notably plate 17. The drawing is quite highly finished in parts, especially in the face of the Urizen-like bearded figure, which tends to suggest the first rather than the second half of the 1790’s. A date of about 1793-95 would seem to be about right on stylistic grounds. The inscription “The Dead” is an obvious clue to the subject, and the crouching position of the bearded figure as well as the struggles of the lower figure to disengage himself from a burial-shroud suggest that the drawing depicts the dead awakening from their slumber. In The Book of Urizen: “The dead heard the voice of the child / And began to awake from sleep / All things heard the voice of the child / And began to awake to life.”2↤ 2 The Complete Writings of William Blake, ed. Geoffrey Keynes (London, 1957), p. 233. This passage occurs on plate 20, which has an illustration of the child Orc, and I can only suggest tentatively that the present drawing may have been intended initially to illustrate the passage but was rejected in the final version. This can only be a speculation, but the drawing does seem to point towards The Book of Urizen, and certainly towards a Prophetic Book rather than an independent composition. There is no record of where William Bell Scott acquired the drawing, and his collection seems to have been gathered from various sources.3↤ 3 See W. B. Scott, William Blake: Etchings from his works (London, 1878). There is, however, some circumstantial evidence of its previous history. It would seem to correspond to drawing no. 116 in W. M. Rossetti’s list in the 1863 edition of Gilchrist’s Life, which is described as “A Dying Man crouching, with floating figures.”4↤ 4 Alexander Gilchrist, Life of William Blake, “Pictor Ignotus” (London and Cambridge, 1863), II, 250. It is mentioned as being in the possession of “Mr. Evans,” who is presumably the dealer to whom Tatham sold a number of Blake drawings,5↤ 5 See Tatham’s letter to W. M. Rossetti of 6 November 1862 (W. M. Rossetti, Rossetti Papers [London, 1903], p. 16). and who also sold some Blake items to the British Museum in the 1850’s. “Mr. Evans” also owned the next drawing in the list, no. 117, “An Angel taking a huge stride in the air,” which must be the drawing now in the Victoria and Albert Museum. Many of the uncoloured works that follow the above two drawings in the list are described as belonging to “Mr. Harvey,” i.e., the dealer Harvey of Cockspur Street. A number of these drawings as well as the “Angel taking a huge stride” are now in the Victoria and Albert Museum, which purchased them in a bundle of twelve miscellaneous drawings from the dealer Parsons in 1881.6↤ 6 For example, Rossetti, nos. 121, 122, 143. The twelve drawings were bought from E. Parsons in 1881 for £7.14.0 (accession nos. 8761-65). Most of the begin page 40 | ↑ back to top Victoria and Albert Museum drawings have, like the present example, a price scrawled on the verso, and in some cases crossed out and reduced. The present drawing has the price of two guineas reduced to one, and furthermore the word “guinea” is incorrectly spelt “guinie” as on some of the Victoria and Albert drawings. It is probable then that the prices were put on by Harvey, who must have sold the residue of his Blake drawings to Parsons, and they seem to have been priced according to the degree of finish. In the meantime he had sold a number of them previously to collectors, including a pencil drawing of “A Squatted Devil” (Rossetti, no. 123) to Bell Scott.7↤ 7 K. Preston, ed., The Blake Collection of W. Graham Robertson (London, 1952), p. 239, no. 126, lot 138 in the Bell Scott sale of 14 July 1892. To sum up, the probable early provenance of the drawing is as follows: Mrs. Blake, Frederick Tatham, Evans by 1863, Harvey before 1880, William Bell Scott. Most of Blake’s miscellaneous drawings came through Tatham as Mrs. Blake’s executor so the provenance is hardly surprising, but if the scrawled prices on the back of many of Blake’s drawings can be established as that of the dealer Harvey then they could provide a link between existing drawings and the often cryptic descriptions in Rossetti’s list.